Today many of us have grown accustomed to thinking that certain techniques from the Buddhist tradition, especially so-called mindfulness practices, have a great deal to contribute to clinical psychology, including psychoanalysis. Yet there is nothing obvious or inevitable about this perspective. On the contrary, it is useful to remember that the original Freudian climate of opinion was a distinctly unfriendly one for anyone interested in Buddhism or other Asian religious traditions. One influential 1931 talk by the American emigrée Franz Alexander (1931) went so far as to compare the meditative state to catatonic schizophrenia! How, why and when did things change — and what are the lessons to be learned from the answers? Speaker: Anne Harrington, Ph.D. is Acting Chair, Professor for the History of Science, Harvard University, specializing in the history of psychiatry, neuroscience, and the other mind and behavioral sciences. 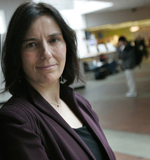 For six years, she co-directed Harvard's Mind, Brain, and Behavior Initiative. She also was a consultant for the MacArthur Foundation Research Network on Mind-Body Interactions. Currently she serves on the Board of the Mind and Life Institute, an organization dedicated to cross-cultural dialogue between Buddhism and the science. Professor Harrington is the author of three books: Medicine, Mind and the Double Brain (1987), Reenchanted Science (1997) and The Cure Within; A History of Mind-Body Medicine (2007) She has also published many articles and produced a range of edited collections including The Placebo Effect (1997), Visions of Compassion (2000), and The Dalai Lama at MIT (2006). In a successful psychotherapy or psychoanalysis, we become healthier, freer and more vital. In mindfulness or meditation practice, we become more tolerant, centered and compassionate towards self and others. What do these practices share in helping us live more engaged and interested lives? Is it possible, even, to use words like "freedom" or "liberation" in relation to mental health? My presentation will draw on two metaphors -- one from Zen Buddhism and one from my own model for psychoanalytic psychotherapy -- to illustrate what I regard as mental, spiritual and emotional health in our imperfect world. 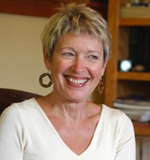 Speaker: Polly Young-Eisendrath, Ph.D., Jungian Analyst, author, psychologist, is Clinical Supervisor, Norwich University, Northfield, Vermont; Clinical Associate Professor of Psychiatry, University of Vermont, Burlington, Vermont; and in private practice in central Vermont. She is chairperson of the non-profit "Enlightening Conversations: Buddhism and Psychoanalysis Meeting in Person" that hosts conferences in cities around the USA. Her recent books are The Self-Esteem Trap: Raising Confident and Compassionate Kids in an Age of Self-Importance (2008) and The Cambridge Companion to Jung: New and Revised, of which she is co-editor with Terence Dawson (2008). She is working on a new book, tentatively called Love Broken Open. Polly is a long-time practitioner of Zen Buddhism (since 1971) and Vipassana (since 1998). Moderator: David Thurn, Ph.D., L.C.S.W. is a psychoanalyst in private practice in Greenwich Village, NYC. A former academic, he has taught at Cornell, Vassar, and Princeton, and has published on Marlowe, Shakespeare, and Freud. Refreshments will be served at 7:30 PM and after the presentation. Presentation starts at 8:00 PM. There is no charge for this evening but seating is limited. RSVP NOW to reserve a space! Dues paid by members of the William Alanson White Society help fund our the programs in our Colloquia Series. Voluntary contributions from non- Institute registrants will be gratefully accepted. Make a donation here, we suggest $5 (students) or $10 (all others) to help us defray our expenses. 1. The participant will recognize the ways their psychoanalytic training continues to affect clinical work long after graduation. 2. The participant will improve their competence by observing how a clinician can fashion a personal version of interpersonalism.